We appreciated the lack of trees while in the Scottish Highlands as the no-more than waist-high vegetation made for safer riding in the frequent gale force winds. But the deprivation got the better of us as we were fascinated by the trees, even the plantation trees, that we were now riding among as we moved south. 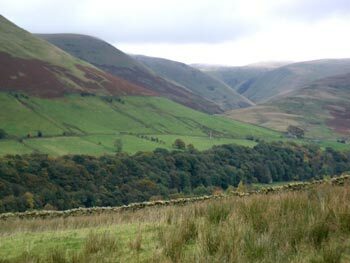 The Highlands' plantations had been far off in the distance but now the trees were reachable from the roadside. I nabbed the first field guide to trees we spotted and learning the common names of roadside and bike path foliage became welcome entertainment during the breaks in the rain. 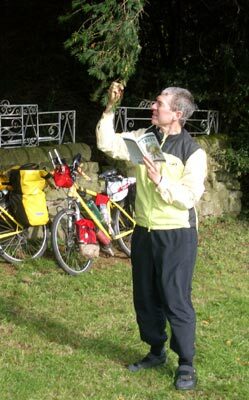 Bill 'bagging' our first yew tree. I'd brought a few more tree names with me from my childhood than Bill had but nonetheless, he added an additional challenge to the exercise by also learning their German names. Predictably, we were only able to identify about half the trees we scrutinized, but given there are over 450 kinds of oaks it's not surprising that our little book with 150 different trees came up short. But sharpening our eye for flora details and identifying species spiced up the pedaling routine. It was immensely more fun to suddenly stop to stare at a tree than stabilize against a strong gust as we had done for so many of the previous days. Berry laden hawthorns and maple leaves spotted black with disease were the most common sightings from one day to the next, along with a varying mix of beech, alder, ash, birch, spruce, and pine. The majority of the species we spotted in the wild were originally North American natives, especially the conifers. Very few of the trees in this British book on the most common British and European trees were actually native to Britain. We quickly learned that the conifers were tough to sort out if they weren't yet sporting their cones and the trees with thick-skinned, bright red berries; winged fruits; and nuts were the easiest to recognize. We also amused ourselves by looking down to identify the trees overhead, as the maples, beeches and horse chestnuts left such distinctive litter on the ground. We imagined we could sort them out by the sound and feel as we rode over the different fallen nuts and their tough casings. But next spring we'll need to relearn all the trees when the seed delivery systems are replaced by flowers. Knowing trees must not be in vogue in Scotland as we were disappointed at the lack of help from the walkers out and about. Even several B&B homeowners recoiled when asked if they knew the name of particular trees--they all disavowed any knowledge of tree names even though these weren't exotic species in their front yards. Only a man working in his obvious specimen garden could help us out by confirming a stag-horn sumac sighting. But despite going it alone on the identification process, we were pleased with ourselves to have named about 35 different trees after about a week of being tree voyeurs. It didn't take long until we assumed we were at about the limit of what we'd be able to spot in the tree world and wondered what little project we could take on next. Dandelions were the only wildflowers still out and the birds were too few and elusive for from-the-saddle bird watching. We had however been startling pheasants with increasing regularity and still spotted the odd heron or swan. What we really needed was something like "The Roadside Guide to the Sheep & Cows of Europe" as there were a number of distinctive breeds in the fields we rolled by. I hadn't intended to collect a library of tree books, but soon we gave in to the beckoning of a second, larger field guide. Not only did it have more trees, but it was organized by leaf type instead of tree family, improving our odds of identifying more trees by using 2 different approaches. And soon we were very pleased to have the second opinion because as we moved farther south the assortment of trees before us skyrocketed. The basics were always there--the maples, Scots pines, and hawthorns--but then Monkey Puzzle trees, eucalyptus, and even more exotic things like Caucasian wingnuts (from Iran) and Turkey oaks cropped up. On days when we had the time to fritter away fixing our gaze on seed pods and leaves, we were still spotting 2 or 3 new trees per day. The Brit's have a long tradition of formal gardens and their avid, world-wide specimen collecting shows up in parks, yards, and on the roadside. Even the most unlikely looking, neglected roadways sometimes had carefully repeating patterns of trees. With a closer look, patterns would emerge like "yew, holly, pine, maple" or "alder, sea buckthorn, black locust, birch" that would go on for a half mile or mile. I'd love to know the story behind these plantings. Whether they were the doing of a government or community sponsored planting or the work of some passionate local gardeners we'll never know. We did learn the story behind one chance finding. A curious, almost fluffy dried flower or seed pod caught my eye and we stopped to analyze it. We quickly decided it was a vine and indeed nothing like it appeared in our tree book. As we were readying to resume riding "hops" popped into my mind, though it was little more than a guess. We paused a moment longer to ask a passing elderly man and he confirmed it was indeed hops. Hops weren't a commercial crop in the area but many years ago a farmer had brought in the waste material from a brewery to fertilize his field and ever since there had been a few hops growing in that one hedgerow. It looked like it made his day to be able to tell the story and we both felt dumbfounded and rewarded by the unlikely find. Careful examination of too many trees on a rare sunny day slowed our progress into Glasgow but like in Edinburgh in the east, the route planners treated us to an almost traffic-free pedal into the heart of the city. All of those rail lines abandoned in the 1960's make for lovely urban cycle ways which are such a joy for us. Once we shifted our attention from the trees to the history, we were surprised to learn that importing tobacco from the colony-era US was what put Glasgow on the map in the 1700's and launched its beginning as an economic power. Our war for independence and subsequent free trade brought an end to the cozy relationship, but Glasgow was committed to international trade and expanded into other industries. Shipbuilding tapped into its ready iron ore and coal reserves and Glasgow was the first seat of the Industrial Revolution in Britain before Birmingham over shadowed it. Unfortunately, the Industrial Revolution (as most eras) was a time in which laboring people were viewed as dispensable, almost as vermin. That disregard for people resulted in deplorable urban living and working conditions. And the lack of good sanitation practices that was a problem in many areas since the fall of the Roman Empire became a crisis in the close confines of the booming industrial cities. Living standards were so bad that during the second half of the 19th century the life expectancy in Glasgow had dropped to 30 years of age. And during WWI, 40% of the conscripts were rejected because the young men were in such poor health. Glasgow rested on its industrial laurels for too long and the lack of willingness on the part of both industry and labor to change with the times doomed it to collapse. Things like not advancing from making pig iron to wrought iron and maligning the new, faster welding techniques for anchoring steel plates onto the ship's hull in favor of using the traditional rivets made them less competitive in the changing world. In hindsight we know that Glasgow's main modern industry, ship building, reached its peak in 1913. It was a long, slow decline and both business and life in Glasgow didn't hit bottom in the 1960's. But after several rough decades, Glasgow successfully reinvented itself as a thriving city of culture and the casual tourist stumbles across little of its difficult times. 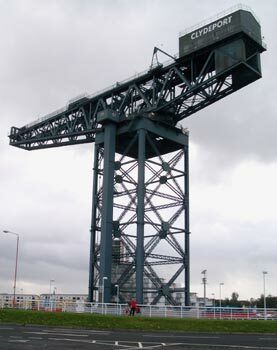 The glory days of the shipping industry along the River Clyde are preserved for history, as is this crane used for loading locomotive engines into ships. Though the crane hasn't been used since 1982, it is still kept in perfect working order. Though the River Clyde was the life blood of Glasgow, we couldn't forget that this large city was in the rugged Scottish terrain. Even around our hotel in the urban core a short walk from the river, there were signs warning of 14% and 17% grades on the city streets. And though we weren't shoving bikes up those inclines we still found ourselves huffing and puffing on our sightseeing outings. Rain gear-clad Bill pushing up another 20% grade hill. Too many times in these last weeks in Scotland I found myself wondering if I was getting too old for loaded cyclotouring. It was so taxing, I got so tired, days off didn't help and I wondered how at 53 I could keep urging my 88 year old mother to exercise when it felt so bad at my age. But a glimpse of my handlebar 'inclinometer' gave a different explanation for my physical and psychological distress--we were grinding up yet another 10 to 15% grade. Though they came one after another, I had to remind myself that there is nothing normal or usual about powering 80-some pounds of a bike and gear up hills that steep. It is exceptional (in most countries) to be on such extreme roads and it is just plain hard work no matter how often you do it. I kept telling myself that the fact that we had literally done hundreds of those grades in the last month didn't mean it's reasonable to expect to do it with ease. We hoped it was getting easier, but unfortunately we had no way to know. 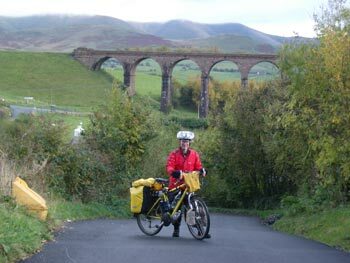 The National Cycle Network bike route maps would show a profile of 2 long, gradual climbs for the day's route that turned out to be 20 to 30 short climbs on grades of 10% or more. We hadn't a clue each day as we headed out whether we'd be doing what we dubbed "Scottish Climbs" of numerous extremely steep oscillations, "Alpine Climbs" that are very sustained moderate grades or "Railway Climbs" of nearly effortless, mild grades. In the Alps, Map Man could look at a map and tell us how many thousands of feet of elevation gain we'd do over so many miles for our big climbs of the day. But with Scottish Climbs, there was no such certainty. And even worse, there wasn't a good way to know that we were getting stronger because there was no way for us to quantify the effort expended. We could measure a given grade and the accumulated gain, but the length of the climbs varied wildly, as did the percent of the given climb that was over 10% or even over 15%. We had to assume we were at least holding our own because we kept doing them, but it was hard to feel confident or ever have a sense of accomplishment. When we entered Scotland in early September we had welcomed the visual interest the more rugged terrain brought with it. Now we hoped that crossing the border back into England would give us some much needed relief from the unyielding steep grades in the west. But Scotland's fare well party for us boded ill, as there was a wicked 20%+ grade just north of the border. Bill made it all the way up, but the extensive "Scottish" and "Alpine" climbing the day before had sapped me and I bailed out part way up. We were stunned that our extra long 'breathing break' at the top didn't deliver a full recovery and we were both still coughing intermittently several hours after the effort. Riding along another glacier-carved valley. Scotland threw that long 20% climb at us and unfortunately, western England turned out to be taxing too. The number of 10%+ grades per day dropped, but the length of them increased, with one 10% grade extending over the better part of a half mile with a 15% zinger in the middle. These horrific grades that unhappily turned our sightseeing-oriented bike touring into an extreme sport were almost always the work of glaciers. The underlying rocks in Scotland are some of the oldest on the earth so nothing is very high due to millions of years of erosion. But the rounded, ancient contours were spiced up quite recently by the glaciers. The last Ice Age that ended 10,000-12,000 years ago had glaciers in Britain poised as far south as the suburbs of London. The huge glaciers carved out the obvious, vast valleys of the Scottish Highlands but were also responsible for other less familiar geologic forms. There were hill-sized piles of boulder clay, grit and rocks that create a chaotic mix of odd rises, ridges, crests and mounds all over the place. Some of this glacial till forms what geologists dub "basket of eggs" scenery with its numerous rocky knolls rounded by the ice. And the uneven pressures of the retreating ice on the layers below it probably destabilized the relatively soft and loose sedimentary rock which then cracked and broke up. That flexing and movement of the deep sedimentary rock then caused fracturing of the more brittle overlying lava layers, causing them and the layers above them to slip and slide, creating a saw tooth terrain. But I must say that knowing that the jumbled steep terrain had such an interesting past didn't make it any easier to traverse. Ruins of a Roman 'milecastle' along Hadrian's Wall. 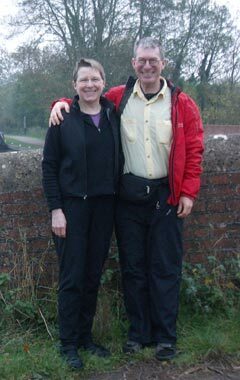 As we moved south with our oscillating hill-climbs, we had our second opportunity to sample Hadrian's Wall. Both the remaining sections of the wall and the associated museums were more impressive here in the west than what we had seen on its eastern reaches over a month earlier. The Roman Emperor Hadrian had the wall built beginning in 122 ce across a narrow section of Britain to keep the barbarians at bay. It only required a 73 mile long wall to stretch from coast to coast at this particular place on the island. Apparently this boundary that roughly parallels the current border with Scotland also was a revenue producer as the soldiers collected taxes from merchants crossing the border. The wall was probably about 15' high and 10' wide and the early turf and wood sections were eventually replaced with finished stone. There were 16 forts spaced out along the wall with some housing 1,000 Roman soldiers. 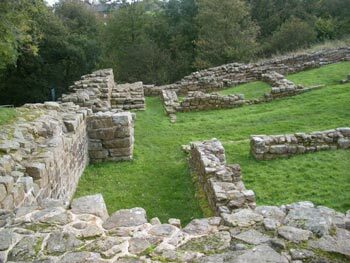 At every Roman mile there was a "milecastle" with under 100 soldiers and between each milecastle were placed a couple of turreted watch towers with a handful of men. We saw the ruins of all 3 types of structures: the forts, the milecastles and the turrets along the western sections of this heavily fortified wall. The wall and buildings were constructed by the Roman soldiers themselves, not ancient subcontractors. And though we are accustomed to being stunned at the sophistication of the Romans, we were still surprised to learn that even the little watch towers on the edge of the Empire had glass window panes. The wall was manned by soldiers for almost 300 years. But in 410 ce when pressure from the adjacent tribes was mounting, the current Emperor ordered the troops back to Rome. This was only one of many places in the Empire crumbling from internal and external pressures and these northern reaches were sacrificed in hopes of protecting the homeland. But it was only decades later that the western Roman Empire met its final demise. Much of the wall met its demise centuries later when it was used as a convenient quarry for the invading Norman's church building spree. Traveling south increased our historical sightseeing opportunities, like at Hadrian's Wall, but it still didn't alleviate our lodging hassles. Bill spent almost all of 2 evenings assembling a route and lodging plan for the next week only to discover that lodging for the last 3 nights was unavailable. Even though it was late October, calling a week ahead for rooms in England still wasn't allowing us to plot a course and expect to travel it. Map Man was close to 'going postal' after this most recent episode--one of many in the last 4 months--so it was time to take drastic measures. We decided to fast forward our tour of England by hopping on the increasingly available trains whenever we got into lodging or route binds. We felt a bit guilty but the sights of interest to us had been few and far between, the weather had been consistently harsh, and the food and lodging prices were budget-breakers. Like the Faroe Islander's (north of Britain), we felt like instead of summer we had had a 'green winter.' We'd only eaten lunch once without shivering in the last 5 weeks--it was time to move on and quickly. We didn't know how long it would take us to get from Liverpool to Plymouth on our new fast track, but we'd ride when it was easy to plan and take the train when it wasn't. The open cast mine with side tunnels. Our new fast track approach meant taking the train for a day trip to Great Orme Mine from Liverpool instead of making it a 5 day biking detour as we anticipated. A rather dull little book on Bronze Age copper mining in Britain we picked up a couple of months ago mentioned Great Orme as the best site for a first hand look at ancient mining. Map Man filed that tip away and with significant planning on his part, we managed to drop-in 10 days before the mine closed for the season. The mine wasn't a huge "wow" but we treasured the cumulative experience of walking through the underground passageways, the short video and the displays of finds from the site. And lucky for us, flooding from heavy rains 10 years ago revealed the presence of a maze of tunnels that were unknown when our little book was written. That's when excavation of the site really took off and they've since discovered 5 miles of narrow tunnels that were dug using only hefty beach stones as hammers and deer antlers as picks. The 9 levels of tunnels go to a depth of at least 200'. These are twisted, contorted tunnels as the ancient miners followed the squiggly path of the copper ore veins, the green malachite. Some of the tunnels are so narrow that it's presumed children of 5 and 6 years of age did the cramped work of chipping out the ore. These malachite veins formed hundreds of millions of years ago when volcanic gases escaped through fractures in the limestone, eventually leaving mineral deposits in their wake. The mine is touted as the largest ancient industrial site in the world--a bold claim we can't comment on either way. But it's now estimated that the Bronze Age miners smelted about 1,700 tons of pure copper from the ore they chipped out beginning around 2,000 bce--enough for 10 million bronze axe heads. 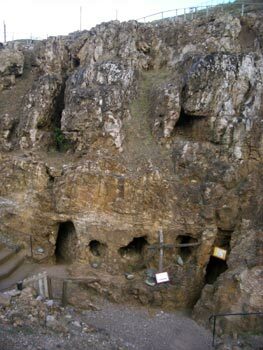 In addition to the extensive tunnel network, the earlier miners also chipped out 7 huge underground galleries and at least 1 open cast mine on the site. The Smithsonian Institute in the US has taken samples to identify the unique 'fingerprint' of the Great Orme Mine copper and so we may yet hear how extensively this mine's bronze was traded. They have established that the tin mixed at the site with the copper to make bronze came from the Cornwall, England area about 300 miles to the south. We took the train to Great Orme from Liverpool as one of our first efforts to fast-forward our way out of England and were glad we did. The forecasted gale force winds were delivered the day we visited the mine and going up the posted 20% grade in a stiff headwind would have sapped our energy and our spirits. As it was, we expected to see white caps on the sidewalk puddles as we sloshed back to the train station in nearby Victorian-era resort town. 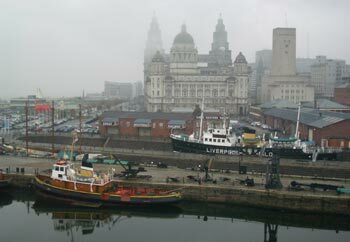 A damp and dank day at Liverpool's Albert Docks. Both being farther south and speeding up our traveling had landed us in the cities more often and the old industrial cities on the western coast of southern England had a harsher air than we encountered elsewhere in Britain. We noticed more murders of people minding their own business in their neighborhoods or homes on the regional evening news than when in other areas of the country. Our guide book's warnings about not being out at night extended to larger areas of a given city than before and we started receiving personal warnings from passer's by. In Carlisle, a woman cautioned us not to lock our bikes up on the street in front of our hotel or they would "Go missing," as the Brits say. On our way into Manchester a fellow cyclist urged us to be quick to move onto the more freeway-like roads at the first sign that we had entered a scruffy neighborhood. And I found the posters near our Liverpool hotel made by parents asking for information regarding their adult son's assailants unsettling. We never felt directly threatened and didn't change our routine as we rarely are out at night and are habitually vigilant about our personal and property safety. We went about our business of seeing museums, admiring the massive old brick buildings and doing the chores we can only do in cities. And despite the safety warnings, we noticed that the friendliness of the people increased again, as it had when we were in the south of England but on the east coast. 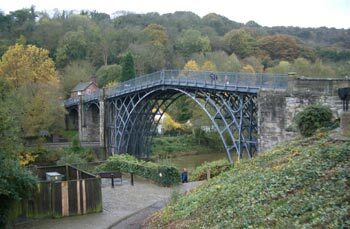 "Ironbridge," the first cast iron bridge ever built. Slowly as we walked the cities and visited the museums the sense of these cities as individual players in the Industrial Revolution began to take shape, giving us a feel for the progression of change. The most surprising discovery was that the politically radical Engels was in Manchester assisting with his father's factory in the mid 1800's when he saw the horrific living and working conditions first hand. He financially supported Marx while they together wrote their "Communist Manifesto" while there. As we made our way south by pedal power and with the help of a number of train rides, we continued to focus our sightseeing on historical topics in and out of the cities. Ironbridge, the first cast iron bridge that was built around 1780 and its associated museums, told the story of iron and coal in the Industrial Revolution whereas our visit to Manchester emphasized the dominant textile industries and the innovative steam engines. And the importance of the seaports and navigable rivers was unmistakable for each of the giants in the Revolution. And of course, we couldn't pass up Stonehenge and the larger and older but less-well known Avebury for another look at the standing stone phenomena like we had seen in the Carnac area of western France. Stonehenge and many of the other Neolithic sites from about 2,500-1,500 bce in Britain featured huge enclosing trenches dug in the chalky ground--an element than wasn't a part of the standing stone tradition in France. The enormous constructed ditch and bank surrounding the stones at Avebury enclosed over 20 acres of land. The much later Iron Age hill forts also were surrounded by massive ditch systems. Maiden Castle, built about 500 bce, is Britain's largest hill fort and its ramparts enclosed almost 50 acres of village. Three concentric ditch and bank systems protected it, with the banks being about 45˚ and the ditches being as deep as small ravines. We also tromped around Old Sarum, another Iron Age hill fort--like Maiden Castle its ditches and banks were dug using deer antlers as picks and these are all that remain of the forts. 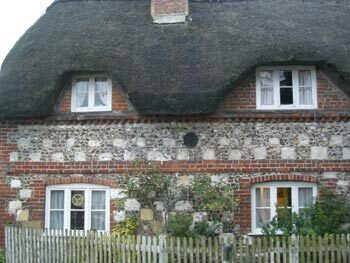 And as we made our way between these Neolithic and Iron Age sites in southern England, we admired the more recent constructions, like this thatch-roofed house built with brick, flint, and chunks of chalk. Both our museum visits and TV watching were hugely enhanced while in Britain because of the shared language. And especially when the museum-going was thin, we appreciated the couple of hours of TV history programs we could watch every week. We were equally grateful for the coverage of the US elections but we found it terribly embarrassing--it reminded us of parts of our culture and country we'd rather forget. There were the interviews with the rednecks that made us cringe as well as the reports about the fiasco's with the early voting in Florida that left us shaking our heads in disbelief. Stark comparisons were made with the first open elections in South Africa and it certainly left the US looking like UN observers should have been called in to monitor the early voting process. The reporters also detailed how the election is swung in the final days by a mass of simple-minded voters and so the campaign is reduced to simple-minded phrases--hardly a flattering portrayal of our people or process. But the compelling content of TV specials in England the last 10 days before the elections kept us watching despite the harsh realities. A 3 hour special, "The Power of Nightmares," on the parallels between Islamic and US fundamentalist thinking that emerged as a reaction to 'selfish individualism' in the late 1940's and '50's was sobering. The editors identified a key thinker from the US and one from Egypt that instilled in generations of still-active policy makers in the US (like Rumsfeld and Wolfowitz) and in the Islamic community, the belief that leaders must lie to the masses to mobilize them to do the right thing for the good of their country. They also identified the myth of organized terrorism (or 'virtual' terrorism) as the latest in the string of myths constructed by our government to create fear as a means of manipulating the public. And they built a case for al-Qaeda, as an unified organization, largely being the product of our government's imagination because of its need for a giant enemy to forward its agenda. They didn't of course discount the existence of terrorism, but the concept of it being the product of an organized network. We shuddered for days after seeing each of the one-hour segments of the "Nightmares" special. We aren't well enough informed on the subject to judge the accuracy of all the facts used to build the arguments but assume that most of it must be true--it certainly didn't contradict anything we knew. And the program's theories provided the best explanations we have heard for our unanswered questions about terrorism. The other interesting election-related specials were far less upsetting. One focused on a handful of spouses and parents of 9/11 victims and how Bush's actions since 9/11 have changed their political views and activism. Other specials delved into the history of big money in US politics; the influence of the evangelical's on our presidential elections since Nixon; the dirty politics of the current and recent elections; and finally, a satirical look at the elections. One show severely criticized Bush's agenda of America spreading democracy when our political process is so corrupted by big money and influence buying of politicians, which they happily detailed. Despite the discomfort of seeing our dirty laundry aired, it was fascinating to look at the US elections through British eyes. Like the post-9/11 coverage, we had to search for the news stories about the elections rather than being swamped by the stories as was the case in the US. The British post-election analysis is just coming in now and one newspaper headline didn't mince words: "How can 59 million people be so dumb?" And casual conversations on the street quickly turn to people telling us how bad they thought it was for the US and the world that Bush won. But the British comedians, cartoonists and satirists are pleased with Bush's victory as many commented that Kerry didn't offer them much to work with. One of the easy barriers to navigate. 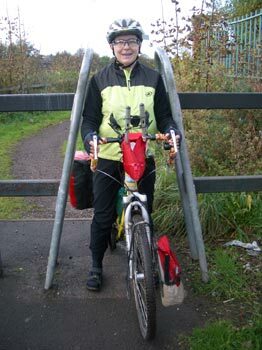 The National Cycle Network routes in western England proved to be challenging and sometimes as aggravating as they were in the east of England and in Scotland. They rightfully work hard to keep cyclists traversing the country off the many busy roads that lack both paved and unpaved shoulders, but at a stiff price. Just the barriers to keep motorcycles off the dedicated sections of the routes turned a relatively flat, 20 mile ride into a torturous, all-day affair. On some stretches of the national bike route, the U-shaped baffled barriers came in the dozens. Many were too tight to walk our bikes through and required pairing up and repeatedly lifting the heavily loaded rear end of the bike to inch it around a tight turn--maneuvers that take their toll on knees and backs. Some obstacles were impassable and required totally unloading the bikes, standing them on end and then lifting them up several inches to clear the barriers while other barricades could simply be walked through. One day we encountered at staircase up a steep slope with elongated stairs but no little ramps for our tires and so the bikes had to be shoved up onto each step. To our disbelief, they also included barriers on the stairs, so 4 times we had to pair up to inch the bike through the baffle on the stairs. And amazingly, these bike route designers don't hesitate to route you through 20% + grades without warning. The surfaces on the bike routes were also highly variable. Some stretches of route were on asphalt and others were barely passable. Miles of one route was a mud fest (even on a sunny day) with fender-less cyclists being mud spattered up to the tops of their heads, both front and back. My arms were sore for days from the effort of navigating through the stiff glop and the muscle effort for my legs was akin to a 15% grade--never before had I worked so hard to pedal on flat ground. And the many times we rode through slimy muck stinking of cow manure we prayed that we didn't tumble over. We held our breath through the stench of the manure paved paths and also every time we rode through massive puddles, not knowing how deep we would sink or what hidden obstacle might take us down. I did topple over while I was skirting along a fence-to-fence wide small lake in one road. Fortunately I was so close to one fence that I caught myself on the wooden slats with an arm. A few bruises on my arm and leg were the only souvenirs of the fall and my bruised ego was soothed by discovering that it was a big puncture in my rear tire that likely took me down. I can't imagine what life would have been like on their mountain bike routes as we were on the 'sissy' routes. The trail surfaces would of course be drier some years and the route engineers say the barriers will come down, but we have our doubts about the barriers. In some areas the barriers have clearly been removed or modified, but others show no signs of budging. Some are placed in circumstances where it is had to imagine that the land owners will ease up on the barriers to entry. Unless you are reassured that the barriers have come down, I wouldn't take a tandem bike on these national routes. Single bikes were sometimes impossible to roll through and tandems frequently would have to be lifted over, with some being close to 5' high lifts above the ground. We haven't used a BOB trailer, but I assume they could be detached from the bike, tilted up at the front end and then threaded through the barriers. Though of course any barriers that were too narrow for my 36cm road bike handle bars to pass through would require lifting the BOB over the top. I can imagine that recumbants or trikes that are either longer or wider than our loaded standard bikes would also be challenging in these barriers. Alas, we still long for our discontinued Goliath tires. We're riding on Continental's replacement model, TravelContact, which just aren't up to snuff. We hope we are at the end of a spat of 5 puncture flats in under 10 days. It's new record for us for flats, both in having so many in so few days and for having 2 days, each when we got 2 flats. They've all been from glass. I don't think there is more glass on British streets, I think the Goliath's were especially good at shedding it. I rode Goliath's for years without a single puncture flat and now we are averaging a flat a month between us. Never did we expect to spend 4 months in Britain this year but one thing lead to another. It was tempting to bug-out early because of the bad weather but we decided not to risk coming back and having a second unlucky year. We made it to most of our "Must see" sights and only have a short list of things we missed. I doubt that we'll make a second try at seeing the northern islands of Scotland as we've experienced first hand how dreadful the weather can be. Since we've been here, there's hardly been a day that gales weren't forecasted for somewhere in Britain and predictably the northern reaches get the worst of it. Those frequent gales also gave us second thoughts about spending a couple days on a ferry traveling from Plymouth, England to Santander, Spain as has been the plan for months. The picture of a leisurely time on board reading and writing was repainted with images of struggling 'round the clock with motion sickness in heavy seas. We never fly within Europe because of the hassles of boxing and transporting the bikes but the money we'd save with the absurdly cheap air fares (sometimes $20) allows buying more solutions, so we're giving it a go. We largely let the airfares dictate our itinerary which has us flying from Bristol, England to Malaga, Spain on November 8. We are looking forward to being back in Spain. We've longed for the budget relief on food and lodging and are especially looking forward to cheaper produce and not having to make lodging reservations for every single night. We of course will miss the ease of speaking English with so many people but are committed to working on our Spanish vocabulary. And I am eager to explore the rich history of southern Spain that was trampled by Phoenicians, Greeks, Romans, Moors and others. Like the end of last year, our time in Spain will be much shorter than planned but we'll stash our bikes there and start our 2005 season from there, giving us another chance. We did it--we finally got our tickets for flying home from Spain. We'll make a brief stopover in Brussels to visit our young Polish cycling friend that is working there for 6 months with the EU, then on to Portland. We'll be back in town for about 8 weeks, from mid-January until mid-March. The first few years the emphasis on coming home was visiting with family and friends, re-equipping for the new touring season, and tuning up our minds and bodies. But this year and last the body tune-ups are more like major overhauls and dominate our schedules. Last year I had a uterine fibroid removed, this year Bill is planning on a hernia repair. Guess it's that getting old stuff--this having to tend to more medical issues more often. Bill started having discomfort early in our traveling season but hoped to make it through the year, which he has done. I did more of the 'toting and lifting' and by being careful he has managed to survive. Time will tell how long his recovery period will be. We made it to Spain! We are currently at a past-its-prime hotel in the past-its-prime resort strip of Torresmolino a few miles outside of Malaga on the southern coast. But the price is right (half of what we paid in Britain) and happily we aren't wearing our long johns or wool socks. Tomorrow we head out (without phoning ahead for reservations for the first time since April) for Granada. Bill estimates we'll be there in about 5 days. We'll spend the next 2 months doing a loop of Andalusia, the region that includes most of southern Spain before heading home for a few months. We expect to feel a chill again as we head inland into the hills though shouldn't get much rain.